Hanblecheya » UFO Over Sun Dagger Mesa NM. » UFO Over Sun Dagger Mesa NM. UFO Over Sun Dagger Mesa NM. 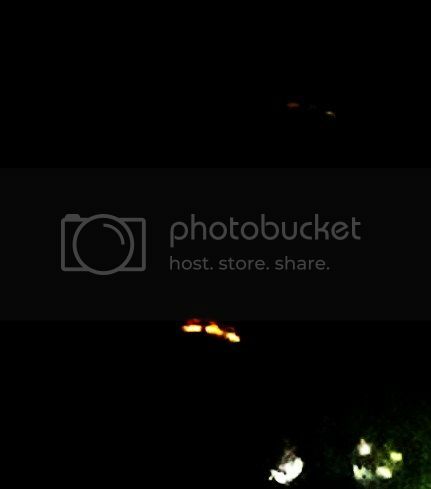 I photographed this UFO in wertern NM. Is it real or Fake? Talk about it here! Re: UFO Over Sun Dagger Mesa NM. I know you have posted up a good few lightening pictures.. I see a ?? UFO on the right but it is impossible to scale the object.. I tried blowing up the photo but there is not enough visible to say really.. New Mexico does seem to be a toyrist spot for UFO's.. The "UFO" in this picture is a Fake. I used an LED flashlight, and took a picture of its reflection on my computer screen with my photo up on it. I did this to show how easy it is to fake a UFO photo. I was debunking a "Chip Coffey" UFO photo he had on FB. It was a reflection of his flashlight on his screen. I was blocked as soon as he knew I was on to his fake. Here is a photo that I took early last year, this was taken over the mountain valley where I live, there are some leaves from the hedge in the bottom right of the picture. I'll let you all draw your own conclusions as to what, I know what I think I saw that night n that's all that counts to me. To the top right of the picture you'll see a 2nd one just fainter. Its not reallly tha clear to me.. I tend to be sceptical unless I saw it for my self. Even then I have never attempted to photograph what I have seen.. Yet if what I saw was also seen at the same time by 50 or so others, that to me is pretty good evidence of something unexplained.. The action of said object or objects is what often leads us to believe it is not of this earth..
strange lights were seen coming to ground level. Your talking about the movie?